Cover the pan and bring to the boil. Reduce heat and simmer for 1½ hours, or until beans are soft but hold their shape. Drain well. Meanwhile, heat 1 tablespoon of the oil in a non-stick frying pan. Cook onion until softened. Add puréed tomatoes, tomato paste, herbs, stock and 1/4 cup of water. Cook for 10–15 minutes, or until the sauce is thick and rich. Set aside until the beans are cooked. Combine beans with tomato sauce in the large pan. Stir in remaining oil, brown sugar (if using) and apple cider vinegar. Heat, stirring occasionally, for 10–15 minutes. Season to taste with cracked black pepper. 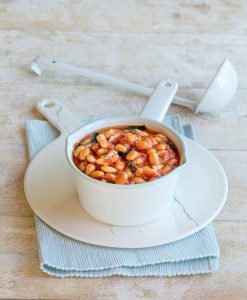 Serve warm baked beans with wholemeal or whole grain toast. Baked beans can be kept in a sealed container for 3–4 days in the fridge, or up to 6 months in the freezer. Recipe kindly provided by the Australian Healthy Food Guide – for more recipes visit their website.